With the successful completion of the cuir bouillied cuisses and armed with new knowledge as a result, I decided to return to working with smaller pieces and their trickier manipulation. 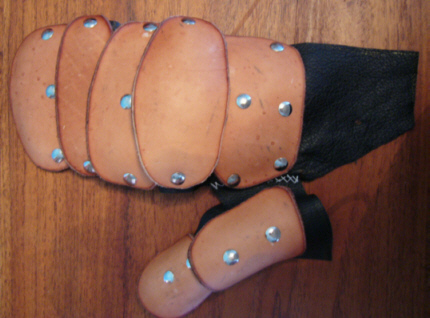 I had intended to make a fingered gauntlet, similar to the famous Wisby gauntlets, but my experiments had made me a bit leery of trying this at my then skill level, as the hot working of the individual finger joints produced unpredictable results. Instead I decided to make a prototype mitten gauntlet for my right hand. (As my right fingers were taking a fair amount of combat punishment at this stage my motivation was high!). Once again, the lack of ability to rework the shaping of the plates when using cuir bouilli meant extra attention to pattern shaping, and heavy card templates were cut and taped to a pair of padded gloves to ensure coverage would be effective when the gauntlet was flexed. Note: the padded gloves are not period and are not used for the final gauntlet. 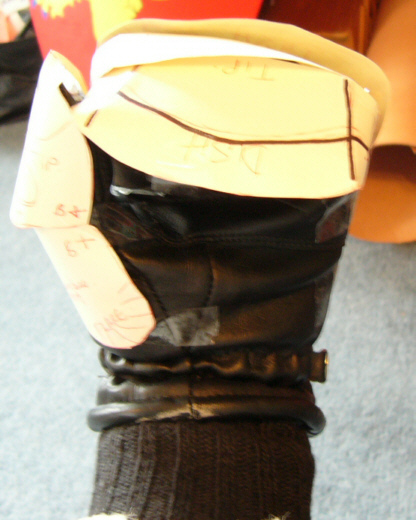 They were used as a "form" as the padding gave a reasonable pre-shrinkage size for pattern pieces (I hoped!). 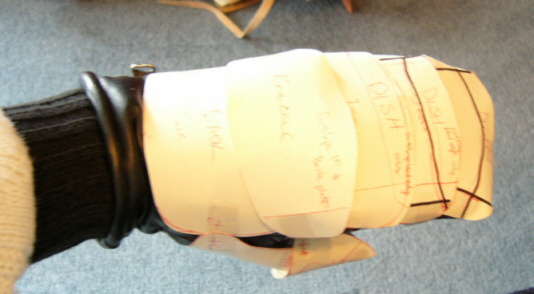 This picture shows the cuff, and gives order of assembly instructions. 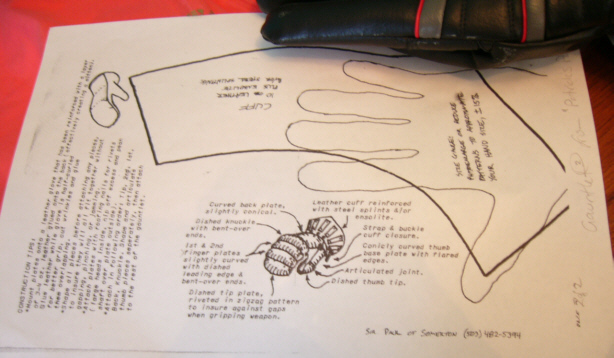 This series of photos shows the template pieces attached to the form-glove. This view is from the top - all the plates lap the next correctly when hand is straight. This view is from the inner side - all the plates lap the next correctly when hand is straight. This view is from the outer side - all the plates lap the next correctly when hand is straight except the outer side of the second joint. The template was lengthened on that side. This view is from the side with the hand curled into a grip - all the plates lap the next correctly when hand is straight. Care will have to be taken with the shaping of the knuckle-plate to ensure the gap is just a result of the template's non-curvature. Inner side of third joint needs lengthening. 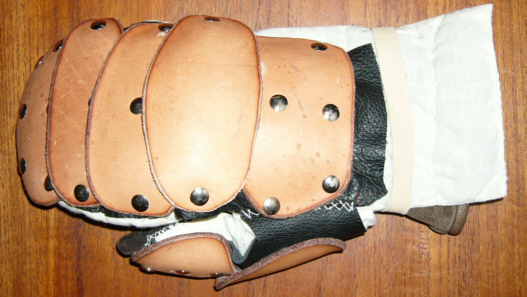 This view is from the side in three-quarter view with the hand curled into a grip to check that the hand-plate underlaps the knuckle plate correctly when hand curled. This view is of the palm - ensuring that the third joint plate extends far enough past the ends of the fingers to allow riveting. This view is of the hand curled inwards to check that all fingers covered by third joint plate. Bend and dish marks adjusted slightly. Bark-tanned leather (3 mm/7-8 oz) cut to modified templates. The form glove stuffed with material to pad out until solid in three dimensions. After donning kitchen gloves, and then checking and adjusting temperature, the leather was taken out of the cold water and placed into the boiling water (100° C/212° F). This time the pan was big enough to take the entire piece at once, so each piece was fully submersed in the boiling water skin down. This was done one at a time as forming needed while still hot. 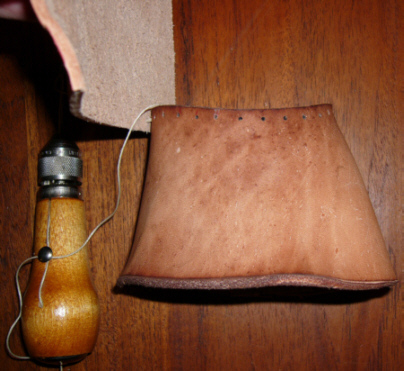 Natural curving started to take place as the leather polymerised and this was carefully monitored lest too much shrinkage take place. As soon as the desired hardness was achieved, the piece was removed from the water, kneaded and stretched into shape in reference to template. Piece then placed onto the glove-form and held in place until it cooled. 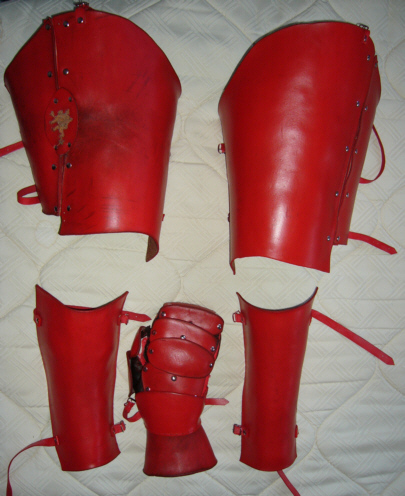 to a leather piece which is then attached either permanently to your gauntlet or simply strapped on over it. 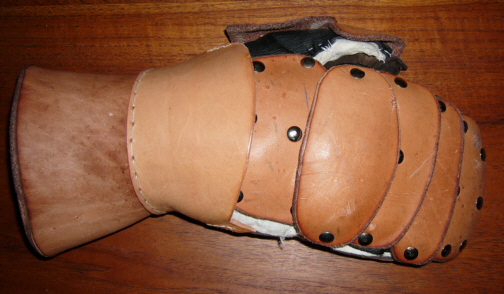 I chose to create a leather liner, rivet the plates on, pad this, and then permanently attach the lot to a fine pig-skin glove with the lining removed. What I wanted to achieve was high protection on the outside of my hand, and sure grip on the inside fingers and palm. In order to achieve this it was easier to pad the armour than the gloves - Sir Michael DeLacy's2 site provided useful ideas. 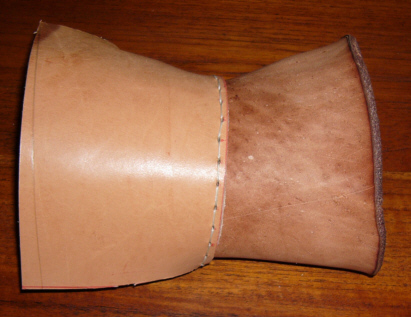 The lining was cut out in two pieces, the main hand and the thumb. Holes were then drilled and plates assembled on top of liner on form, and liner holes marked for punching. The plates were the riveted to the liner in the order suggested by Sir Michael3, using tubular rivets - at stress points a washer was placed between the inner liner and the rivet before peening the head over. 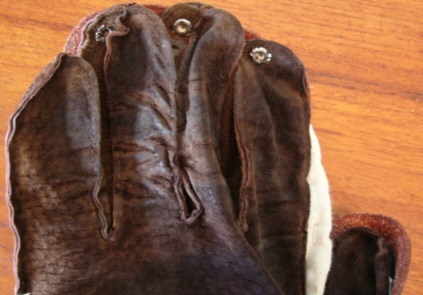 The glove was tried on after each plate was riveted to check positioning. 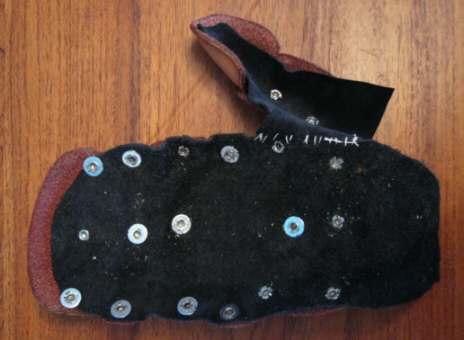 The thumb was riveted separately and then sewn to the main body. This view is of the riveting from the inside. Note that the third joint plate extends well past the end of the liner giving good coverage of finger tips. This view is of the riveting from the outside. There appears to be a gap between the outside end of the first and second joint plates but this proves not to be an issue when the gauntlet is assembled. The liner is curved as if the hand is gripping something and the coverage by plates is checked. 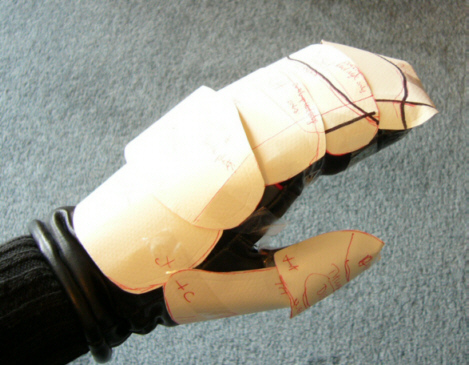 The final check before moving on to the next stage of assembly was to attach the liner and armour to the real glove with rubber bands and then do the 'real life' movements the gauntlet will do, e.g., hold sword and move through wards and strikes - check for gaps and potential binding of movements. Adjust as necessary by re-riveting or very careful filing of plates. 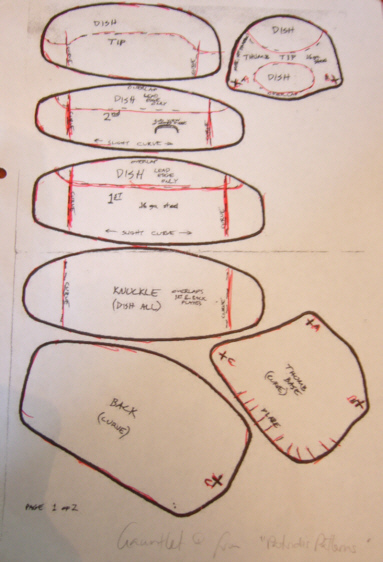 A pattern was created by tracing around the glove, creating a smooth 'mitten' shape rather than individual fingers. The pattern was placed on four layers (for two gloves) of calico and a 1 cm (c. ï¿½") seam allowance was added and the pieces cut out. 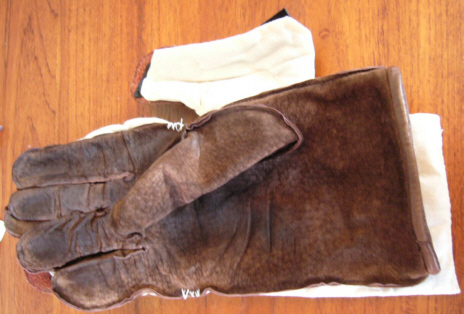 A thin layer of wool padding was put between two pieces of calico and the 1 cm seam hand-stitched around the glove, leaving about 6 cm unsewn in order to be able to turn the padding inside out. 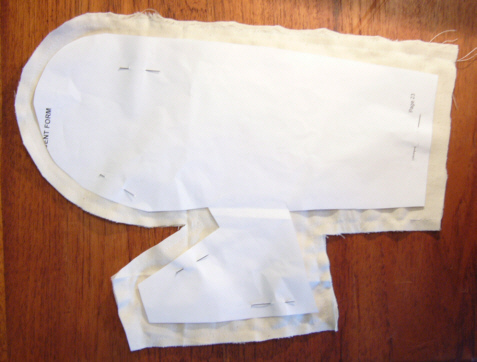 The padding is turned right-side out, the remaining seam closed, and then the pad is lightly quilted to keep everything in place. Padding then basted to liner. 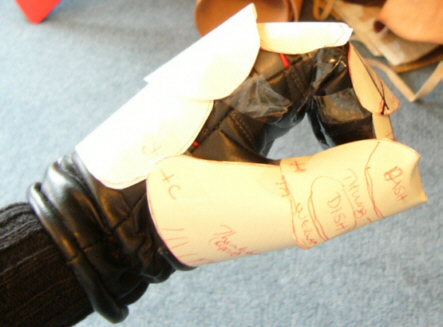 The glove fingers and back of hand are now armoured - top view. Side view - note that, as in previous picture, there is a gap in coverage around the web of the thumb. As this is consistent with the pattern, I decided not to worry about it unless problems arose in 'field testing' (they didn't). 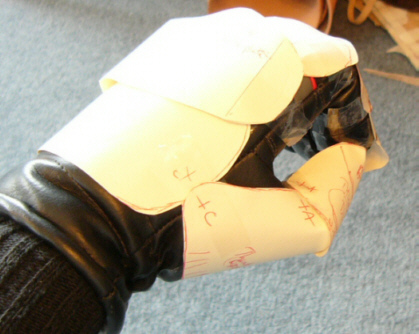 As this gauntlet is a prototype I wanted a variety of hand sizes to be able to put it on. At the same time it needed to be stable, so I borrowed the final attaching points from armour which is simply strapped over gloves. 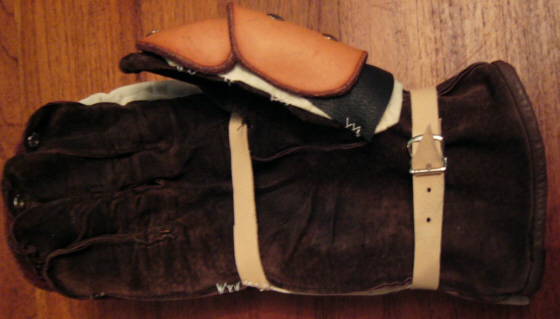 The palm strap is sewn down on both sides and prevents the hand from riding to high in the gauntlet. The wrist strap has a buckle for finer adjustments. It is also sewn on. 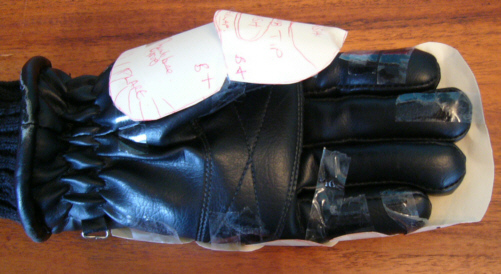 The last step in assembly is to rivet the third joint plate to the finger tips of the glove. This involves donning the glove and marking three riveting points which both allow your fingers to fit into the end of the glove and ensures that the plates will move in time with your fingers. Inside view. 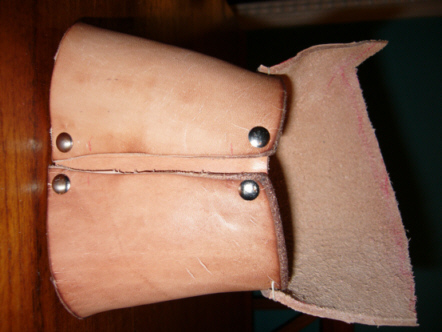 The pattern called for the cuff to be made of leather with splint reinforcing. 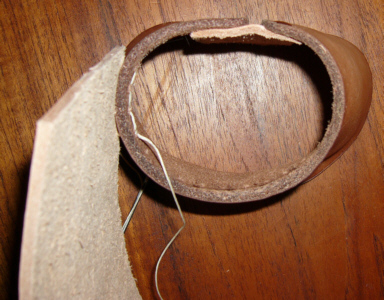 I decided to try making the cuff of cuir bouilli as well, with the later 'hour glass' shape in mind. I think this was a mistake - see 'Lessons' for explanation. 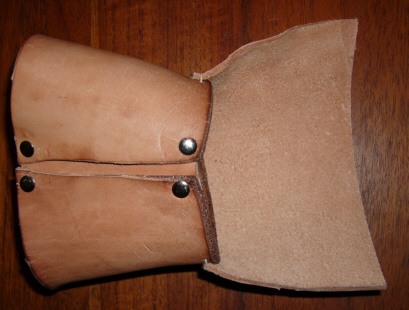 The cuff was cut to pattern and cuir bouillied and a reasonable flare established. This was important as it has to fit over the sleeve of the gambeson. I hardened this piece more than the fingers both to maintain the 'flare' and to give the more frequently targeted area a higher level of protection. Picture is view from the from - flare is deliberately wider to the outside. 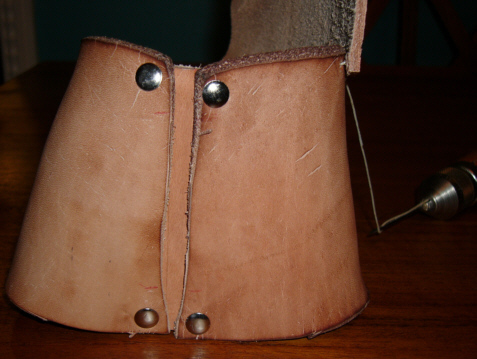 The cuff shrank a bit too much for a comfortable fit over gambeson sleeve, so a joining-piece of plain 3 mm leather was riveted on. My solution was to cut a plate of plain 3 mm leather into an extra plate to cover the gap. This had the advantage of filling some of the gap between the thumb and fingers and also provided and extra layer of protection on the back of the hand. The photo shows the process of stitching the plate on - there was insufficient space to rivet inside the cuff. Sewn together - outside view. Shaping added to give coverage of thumb web. Side view showing how new plate angles slightly upwards so that back plate can articulate under it.. 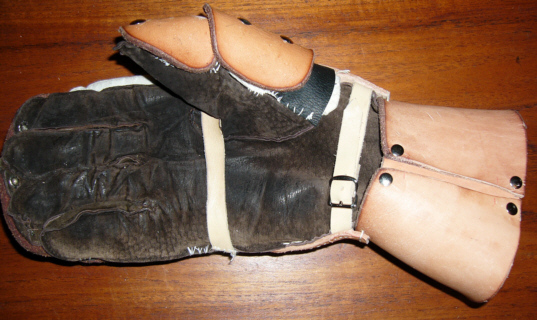 The glove was then attached by sewing it at two points at the wrist to the extra backplate. The gauntlet is now complete - whew! View from the top of the completed gauntlet. View from right side. The gauntlet was later painted to match the rest of the armour. The gauntlet is between the demi-greaves. 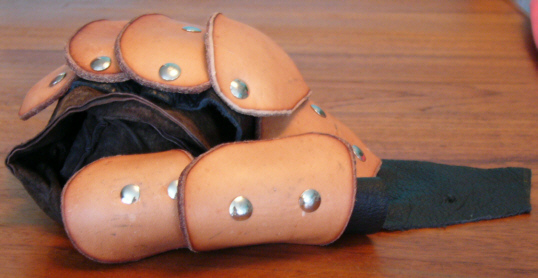 Deciding to make a cuir bouillied cuff was an interesting exercise, but I now think a mistake for this particular style of gauntlet. Firstly, I had to add an extra plate to cover a gap which I created! Secondly, in order for that plate to work the back plate had to slide under it. This creates a clumsy articulation with the back plate. It also took a lot of extra work to shape the non-cuir bouillied piece so that the movement of the articulation didn't bind. Next time I would extend the width of the finger plates so the armour went slightly farther around the hand. Despite the above points, the gauntlet far exceeded my expectations. It is light and comfortable to wear and yet provides excellent protection even if I'm stupid enough to block an incoming strike with my fingers! The articulation - even with my work-around - is smooth with no binding. Finally, I can pick small things up off the floor with my finger-tips when wearing the gauntlet, so the fine control is there. As a result, even though this was meant to be a prototype, I find that I am wearing it so regularly that I don't want to take it apart to make the improvements it could use. They'll have to wait for a whole new glove! 3 tip, second, first, back, knuckle, thumbs separately and then joined to body.